Country-Wide is focused on delivering content that helps sheep, beef and arable sector farmers to maximise long-term profitability. Country-Wide is packed full of valuable farm management information no progressive pastoral farmer can afford to miss. It targets on-farm information needed by New Zealand’s leading drystock and arable farmers, and gives you an insight on investing this information back into your business. 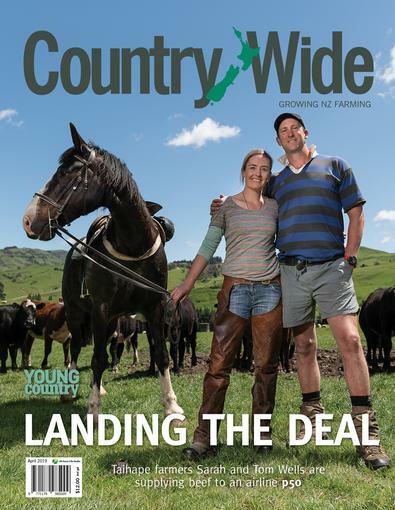 Including seasonal updates, stories and developments on agribusiness, as well as profiles of on-farm examples and success, Country-Wide celebrates, entertains and inspires the rural sector. Every issue of Country Wide Magazine I have ever picked up to read has had some really interesting articles and information relevant to the type of farming we are involved in. It is a very comprehensive magazine, with a broad range of farming industries covered, there is definitely something of interest for everyone. My husband and I find ourselves reading all sorts of articles which may not be relevant to us, but are very informative. I had a medical appointment last week, and while waiting, I picked up an issue of Country Wide that was several years old. There was some great information in it, and on leaving the clinic I asked reception if I could purchase it from them. I am now about to take out a 3-year subscription, as the magazine is a great resource, and very good value!